Stroke caused neurological damage to the Central Nervous System (CNS). The damage to the CNS causes sensitization to the pain system. The extent of pain and the areas affected are related to the cause of the injury. CPS begins shortly after the causative damage, but may be delayed by months or even years. CPS can either be relegated to a specific part of the body or spread to the entire body. Pain may be moderate to severe in intensity and is often exacerbated by movement, light touching or temperature changes, usually cold temperatures. Burning pain is the most common sensation, but patients also report pins and needles, pressing, lacerating, aching, and extreme bursts or constant sharp or unremitting excruciating pain. As a result of the constant extreme pain, blood pressure often rises. The year was 1994, I was on an important business trip in Toulouse, France. For years, I had been regularly suffering from migraine headaches. My neck would become very tense from the effects of the migraine. To relieve the tightness, I would frequently push my head sideways to make my neck crack. Little did I know how much damage the years of repeatedly cracking my neck did to it. Then, on the morning of June 20, 1994, I found out! The inner wall of my left vertebral artery partially broke off like a flap. It temporarily blocked the oxygenated blood from flowing to my brain stem causing a catastrophic stroke. The location on the brain stem where the stroke occurred is extremely rare. My doctor had only seen a single similar brain stem stroke in over 40 years of practice. He explained to me that my stroke happened in the brain stem, which is basically a bridge between the brain and the central nervous system. He went on that the brain stem controls all of the mechanical skills areas of the body (breathing, moving, talking, etc). And that my brain’s ability to control the muscles in my body had been severely stunned. I could not move anything below my nose. My whole body became flaccid, like a wet noodle. Oddly, I still had normal sensation over my whole body. I could feel every touch on my skin, including the 6 weeks that I was in the hospital of painful needle pricks necessary for the daily drawing of blood. I finally came home from the hospital. As time went on, there was little but somewhat noticeable improvement. At two months, the muscle tone in my extremities returned and replaced the flaccidity. After about four months, my leg muscles began to respond. The quadriceps muscle for both legs woke up first. I had heard that it was common for the larger muscles, like the quadriceps, to recover first. It felt strange that my right and left legs were recovering at different rates, though. The whole right side of my body is still slightly stronger than the left. My right quadriceps consistently lagged the left by at least 10%. My quad muscles were slowly getting stronger. My left quadriceps probably started at about 10% of full strength and very slowly increased to about 40%. The right started at about 5% of full strength and very slowly increased to about 30%. This is where my leg strength maxed out, though. My hamstring muscles were still very weak. I could feel a faint contraction in the muscles but could not make them move. In other words, if I thought about it and tried really hard, I could make my quadriceps push my legs down to make my legs go straight. But, I could not pull back with my hamstrings and pull them back. Those muscles need to work together, pushing and pulling, in order for me to be able to walk. Unfortunately, because my hamstrings were so weak I could not make my legs move backwards. Eventually, my quadriceps became strong enough that I could stand with assistance. Every morning, while transferring from bed to wheelchair, my wife would stand me up straight for a few minutes and give me a hug. It felt so good to be able to push myself up to standing position, flex my quads on demand and feel my leg muscles respond. This routine went on for at least the first three years after my stroke. Recovery from a stroke, after the first six months, is painfully slow. This slow-down in recovery happens to all stroke survivors so it was not like it was happening to just me. Something that concerned me, though, was that as my legs grew stronger I could feel the muscles in one leg better. I could not understand it, my left quad felt light and normal but my right quadriceps felt heavy and dense, like it was filled with lead and weighed 50 pounds. Little did I know that this new sensation would soon become my worst enemy. CPS did not happen immediately following my stroke. The CPS waited almost four years after it. For almost four years, I had a relatively busy schedule seven days per week. Monday, Wednesday and Friday were days for out-patient therapy – Physical, Occupational and Speech. Although the therapy sessions consumed over three hours on these days, every other second when possible, was spent on the computer. I would sit in front of it, sometimes for 10 hours per day, cyberspace became my way of life. My therapy sessions finally ended after almost four years. It seemed that simultaneously with my therapy sessions ending that the first signs of CPS started. My CPS was not painful at all at first. The CPS began with just a light tingling in my right leg. Shortly thereafter, my left leg started to lightly tingle, too. I was not concerned as I thought the tingling sensation was a good thing. I had heard from my stroke survivor friends on-line that paralyzed limbs often tingled right before recovering. As far as I was concerned, the recovery for my legs had started to progress again. a major concern! I was utterly confused about what was happening. It seemed like the tingling in my legs was intensifying! They had developed a pins-and-needles sensation and it felt as though both legs had become severely sunburned. It was extremely painful whenever my legs were touched. Even incidental light touches irritated them. Touching or leg movement caused the combination of tingling, pins-and-needles and severe sunburn. It felt as though my legs were lying in a fire and as if though metal wire brushes were simultaneously poking every square inch of them! Plus, it felt like an uncomfortable cold fluid had replaced the normally warm blood circulating through my legs. No longer did my legs naturally warm to room temperature by themselves. Light breezes or cooler temperatures caused my legs to easily become irritated, causing the severe sunburn pain with pins-and-needles to flare up. the blanket was soothing and brought comfort! I quickly adapted to wearing a heavy blanket on my legs full-time even in the middle of the summer. I was determined that just because I now had CPS I would not let it slow me down. My daily activities soon became a routine. Getting ready for the day was the worst! Hygiene involved me getting a bed bath followed by my wife dressing me. During this time, she had to frequently touch my legs, bend them at the knee and turn me in the bed, from side to side, in order to wash both sides of my body and then get me dressed. After I was almost completely dressed in bed, she then had to move me to transfer me to my wheelchair. This consisted of her picking my legs up and moving them off of the side of the bed so that they were sitting flat on the floor. Then, she lifted my upper body so I went from lying flat to now sitting up on the edge of the bed. Next, she would put my head down by her hip, hold me under my arms and would count to three. On three, it was my job to push with my legs while she pivoted my body from my bed to the wheelchair. This is aptly named the sit-pivot transfer technique. Once I was in my wheelchair, she would pull and tug my sweatpants and get me positioned evenly on my cushion so I was comfortable for the day. The bad thing was that the intense burning sensation would start with the first touch of my wife’s hand when she started washing me. The burning pain would linger on for almost an hour after the last time she had to put her hands on me to transfer me to my wheelchair. Every day, I had to endure the agony of this for almost three straight hours. It literally felt like my legs were being burned by a blow torch. The pain was gut-wrenching and lingered on for almost an hour until it would finally subside. What was strange was that if I was not being touched, like when I was sleeping, my pain level was almost non-existent. But, the very second I was touched and moved around in my bed the extreme burning sensation began. I could not continue to live this way! I needed to know what was happening to me. I wanted to do whatever was necessary to make the pain go away. I started off trying to find out what was happening to me by going to see my General Practitioner. He was baffled and recommended that I see my Neurologist. Several months later, I finally had the appointment with my Neurologist. He was perplexed, as well, and could not identify the problem nor offer me a solution. Over the next six months, I saw several more doctors with no luck. Nobody could identify the source of my pain or provide a treatment plan. I even tried acupuncture to no avail. Acupuncture treatment was fun! Not! It consisted of the acupuncturist placing 3” diameter suction cups all over my legs. Each cup caused a tiny vacuum on the skin under it, which was extremely painful! I had to lie still with those cups all over my legs for like 15 minutes. I was really mad because I had to endure this pain, plus the acupuncture treatment did absolutely nothing for me! My wife and I spent almost two years of countless doctor appointments only to learn that they knew little more about this mysterious pain than we did. I was at the threshold of my limits for pain, too. I remember one night, as my wife prepared to transfer me from my wheelchair to my bed I just broke down in tears. I anticipated the intense pain I would have to endure as she moved me to my bed and then had to straighten my legs out. Just the mere thought of the upcoming pain had become too much to bear. One night, my wife was browsing through a magazine called Physical Therapy. She came across an article about tingling, pins-and-needles and intense sunburn pain. 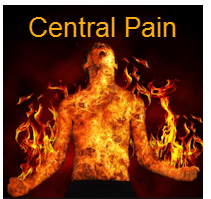 The formal name for this pain was something called Central Pain Syndrome (CPS). We were both so excited because the article described my pain. . .EXACTLY! My type of pain had a name! As she read further, the article explained that treatment should be performed by a Pain Management doctor. We did not know what a Pain Management doctor was so she got out our pamphlet of approved doctors by our insurance company. She found a doctor named Dr Peter Staats at Johns Hopkins Hospital Pain Clinic. I was so fortunate to have a world known premier hospital only 30 miles away in downtown Baltimore. Three weeks later, I was finally talking to a doctor who understood my problem with the burning, tingling and pins-and-needles pain in my legs. Dr Staats was a very kind and compassionate man. He listened patiently as I mouthed out an explanation of my pain, while my wife read my lips and turned what I said into words and then sentences. What was cool was that he was familiar with the type of pain that I was describing. After I finished venting, he explained that my stroke damaged my Central Nervous System (CNS), which was causing my CPS. He further explained that pain is ordinarily a protective sensation that causes a person to move away from its cause, such as withdrawing one’s hand from a fire. In the case of CPS, a source of the pain does not exist. Instead, the sensory pathways within the brain were damaged by the stroke. This stimulates central nerve fibers, which created the perception of pain. So, what this meant was that my brain stem had been damaged in such a way that my CNS had stopped functioning properly. My CNS perceived the pain, like the burning and pins-and-needles sensation, although the source for that pain did not actually exist. It made sense. Then, he told me he had bad news and good news. The bad news was that CPS unfortunately could not be cured! The good news was that there were drugs that could help me manage my pain but it was not possible to actually cure me of CPS. He then developed a plan to help me manage it. The first step was to take the “edge off” of my pain. The pain in my legs was becoming increasingly more intense by the day. The pain would zap me like a high voltage electrical charge wherever my legs were touched. The zap would then morph into severe sunburn on that spot. So, to take the “edge off”, he prescribed a low dosage of a long acting pain killer called Oxycontin. He then tested my body for spasticity. When he saw how stiff I was, especially my legs and knees, he told me that I might be a candidate for an ITB pump. He said that the pump would be permanently implanted under the skin on the left side of my abdomen. He explained that ITB stood for Intrathecal Baclofen and that the pump would continuously inject a drug, called Baclofen, into my body. The continuous injection of Baclofen would relax the spasticity in my legs. What was even better was that he told me the ITB Pump would also reduce the pain. I thought it sounded too good to be true! I asked him to tell me more. He then picked up a small circular shiny object from the table in the exam room. The object closely resembled a stainless steel hockey puck. What he was showing me was the demo model of a Baclofen Pump. He explained that the pump’s reservoir only held 40 ml of liquid and that it would have to be refilled by a nurse every two – three months. The pump continuously injected Baclofen through a space, called the intrathecal, in the spinal cord. A small tube, called a catheter, would be threaded from the pump through the body, around the back and into the intrathecal space. Because the Baclofen would be delivered directly to the spinal cord, the symptoms could be controlled with a much smaller dose, about 1/300, than is needed with oral Baclofen. The goal of an ITB pump is to control the symptoms and to better reduce the need for oral pain killers; thus reducing their associated side effects. Depending on the dosage and rate of delivery, he was confident that this would effectively relax the spasticity in my legs and help reduce my pain. Everything he said sounded good. I was excited and I told him I was ready to proceed. He told me that we had to perform a trial before he permanently implanted the pump. A trial is a standard screening test that is required to determine whether an ITB Pump is a suitable treatment option for a patient’s severe spasticity. In the trial, the patient receives a small dose of morphine injection via a lumbar puncture, which is a minor medical procedure. Then, the patient’s response is evaluated. So, I scheduled a date for the trial. I waited for the trial date with much anticipation. I thought the trial would be a simple procedure. Boy was I wrong! It required that I be admitted to the hospital for the weekend. Little did I know that the lumbar puncture would be a major source of the problems I next had. My doctor explained that migraine headaches typically occur anytime the lumbar is punctured. The puncture to my lumbar caused a severe migraine headache right away. I have a very small tolerance for a migraine headache and I immediately became nauseous. That was the worst two days of my life! The migraine headache and nausea traumatized me. I was a different person for several weeks following that weekend at the hospital. I was not motivated to work the usual long hours at my computer every day. Instead, I would just spend the day watching television. My brain felt fried! At least I had passed my trial for the ITB Pump. A surgery date was scheduled for several weeks later. Finally, the big day arrived! Surgery was scheduled for the early morning hours. My wife had to get up around 2:00 am in order to get herself ready. Next, she started getting me up around 3:00 am. By 6:00 am, we were in route to the hospital for a 7:00 am check in appointment. Although, my wife and I arrived the required two hours early, we still had to wait for several more hours in a huge Waiting Room. The Waiting Room was partitioned into dozens of smaller private waiting rooms. Each equipped with its own private flat screen television and with several tasteful pieces of overstuffed furniture, much like a den, or family room, in your house. After about three straight hours of watching boring morning shows, a nurse came and took us to my Recovery Room, where we waited for several hours more. After a briefing of what to expect in the OR by the Anesthesiologist and an OR Nurse, I was transferred from my comfortable hospital bed to a narrow, hard and uncomfortable gurney. Seconds later, we were zooming down the hall and into the Operating Room (OR). The OR was a well lit room, obviously sterile and freezing cold. The room was crowded with people wearing caps, gowns and with masks covering their faces. Immediately, the Anesthesiologist was in my face with a mask telling me to count backwards from 100. Suddenly, I was being woken up, “Mr. Mallory, Mr. Mallory wake up, the procedure is over”, they were repeating loudly! I hate being awoken after surgery. What an obnoxious way to wake up! I half way opened my eyes and quickly closed them again. The next thing I knew, several nurses were pushing the gurney back to my smiling wife and awaiting Recovery Room. I had to lie there for four hours to make sure I was okay. It did not matter to me because I was extremely sleepy. A half hour later, I started waking up and slowly opened my eyes. My BRAIN STEM STROKE was very rare and caused serious permanent disabilities. The brain stem is in charge of all the functions your body needs to stay alive, automatic activities like breathing, digestion, and circulating blood. My type of brain stem stroke damaged nine of my twelve Cranial Nerves. Several of those nerves affected me being able to control most of the muscles in my body. This included muscles that are necessary for speech like the diaphragm, vocal cords, tongue, lips and just about all of the facial muscles. My limbs technically were not paralyzed but extremely close to it. It was strange because I still had sensation everywhere. It felt like I had weights all over my body holding me down. I was so weak that I was essentially quadriplegic. I was living everyone’s worse nightmare; I could not move nor could I speak! I was LOCKED-IN! Locked-in means that you aware of what is going on around you but you cannot move or speak due to lack of muscle control below the eyes. I had my stroke while on business in Toulouse, France. The French doctors probably saved my life but they cared little about communicating with me. We had essentially NO COMMUNICATION. They only came in my room during rounds to look at me and read my chart. Sometimes they might write something for the nurses in my chart. Other than for them to do that I never saw them! They initially cared for me until my health stabilized. Once my health improved enough to travel I was put in a MedJet and flown back to the states. After arriving back in an American hospital, one of the hospital staff’s goals was for me was to just have simple communication. Doctors and nurses spoke to me but they just asked me yes and no questions. My communication technique was limited to BLINKING my eyes once for yes or twice for no. I was scared to death that yes and no blinks is what my life was reduced to. I was in two acute care hospitals during the first three weeks after my stroke until my condition stabilized. Next, I was transferred from an Acute Care to a Rehabilitation hospital. Acute care gives you medical attention while you are sick, which is right after your stroke. Rehabilitation hospitals have the task of helping you relearn to walk, talk and things like how to perform personal hygiene or how to dress yourself. Teaching me to communicate beyond eye blinks was one my rehab doctor’s biggest concerns. This was addressed almost immediately. The first thing my Speech Language Pathologist (SLP) did was to make a COMMUNICATION BOARD for me. There are many types of Communication Boards. Some boards are made by the SLP and some can be purchased in a store. Mine was fabricated from 1/8” thick Plexiglas. It was approximately 18” wide by 24” long. My SLP stuck 2” letters of the alphabet on it. The person I was communicating with would stand about 2’ away and I would stare at a letter on the board. They would look at my eyes through the Plexiglas and track my gaze to that letter and call it out to me. I could say anything by staring at letters on a piece of Plexiglas board and spelling out sentences. My wife and I became extremely proficient at communicating by this means. She could anticipate my needs and what I was trying to spell. Communication was cumbersome but it soon became a common way for me to talk. I actually had another form of communication while I was an in-patient at the rehabilitation hospital. It was very effective and I used it more often than my Communication Board. Most nurses did not know how the Communication Board worked. It definitely was not the nurses fault. All of my nurses were great. They gave me special care because I was quadriplegic. During the day shift I was out of my room doing therapy. By the time I returned to my room the shift had changed. Second shift nurses were usually scrambling like crazy to take care of other patients. And third shift nurses did not have anybody to show them how to use the board. So, I developed MY OWN METHOD to communicate. If I needed something in my room like the television turned on or off I would STARE at it. If my head hurt and I wanted Tylenol I would BLINK my eyes real fast several times. By staring or blinking I communicated quite effectively with the nursing staff. About three months later, I was finally discharged from the rehab hospital and sent home. I took the Communication Board home with me. For months, it was still my primary form of communication. One day, while sitting at home watching TV I suddenly had the urge to push my legs. At first, I just thought I had muscle spasms in my legs. But then, I felt that I could make my leg muscles fired on command. It is not uncommon for muscles to suddenly wake up months after a stroke. I discovered that this new muscle control allowed me to push and extend my legs. If I was in bed, lying in the fetal position, I could push my legs straight. If in my wheelchair, I could push and try to straighten my legs, which would force my feet down into the wheelchair’s footrests. I soon discovered that if I just PUSHED MY FEET INTO THE FOOTRESTS I was able to push a faint sound out of my mouth! This was really exciting! For nearly a year I could not conjure up a peep. Now, I accidentally figured out how to make a sound on demand. I demonstrated this technique to my out-patient SLP and she became thoroughly intrigued. She theorized that pushing my leg muscles into the footrests was causing my whole body to tense up. This gave me the strength to take a breath and force air from my diaphragm. In turn, when I tightened my throat it caused my vocal cords to close enough to slightly vibrate. This created a faint but distinct sound from my mouth. The key to remember is that I was not technically paralyzed. This fact is what made the progression with my speech even possible. My muscles were extremely weak but I could still control their movement with my mind. Pushing my feet against my footrests gave my other muscles just enough strength that I could coordinate making my diaphragm take a small breath in and forcing a small breath out. I had to coordinate bearing down on my legs, pushing out as much breath as I could and at its peak think about tightening my throat, as I exhaled, so my vocal cords could move together. Also, making a sound did not happen spontaneously like it does in able-bodied people. Each of my muscle movements required an individual thought. I had to effectively learn everything from the beginning. It required patience, extreme concentration and lots and lots of practice! My SLP formulated a plan for getting me to talk again. Whenever I wanted to try talking I would push my legs. I practiced this method every day and soon learned how to pronounce several words. Pronouncing words is much more complex than just making a sound. I had to go through all the coordination of motions that I explained was necessary to make a sound but now I had to think about making my facial muscles move so I could purse my lips in umpteen different formations while trying to put my tongue in the proper configuration. Certain words were impossible to pronounce no matter how hard I tried. I could not make my tongue lift up or stick it out very far. Words with the single consonant letters c, s or t and words with the consonant blends, such as bl, ch or spl were out of the question. One day, my wife was browsing through a magazine about physical therapy. She happened to read an article written by a physical therapist that had a brain stem stroke similar to mine. The therapist had also lost her speech. She was slowly regaining it but was also struggling pronouncing words with certain sounds and blends. Her SLP recommended that she use something called a PALATAL LIFT PROSTHESIS to help her speak. The Palatal Lift is an oral prosthetic like a denture. 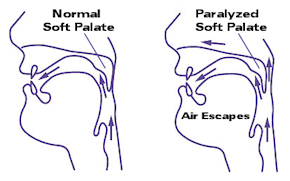 The way she explained it was that her stroke caused her soft palate to fall from its normal position. My wife and I were very excited about the Palatal Lift. It sounded like its purpose was for people that had problems with their soft palate, like me. We spoke to my SLP but she did not know much about them. In the meantime, I kept practicing saying the words I could pronounce using my pushing technique. This went on for a couple of months but there were still those sounds I could not make. One day, at my Speech Therapy session, my SLP wanted to check to see if air was escaping out of my nose while I was trying to talk. She brought out what looked like a GIANT PLASTIC CLOTHES PIN with pads that covered the area that went over the nostrils. It closed gently but with enough force to pinch off the nostrils although not hard enough to be uncomfortable. Immediately my speech improved! Most of those hard to pronounce words with certain consonants and consonant blends now came out clearly. I learned that if someone held my nose I could make those sounds. Apparently air was escaping out of my nose preventing me from making the sound I wanted. With this discovery, my Speech Therapist felt that maybe the Palatal Lift might indeed help. There was no guarantee but I was willing to try. Life without talking was too inconceivable. Besides, I looked pretty silly with someone holding my nose every time I wanted to talk. We found a dentist who had experience making Palatal Lifts (actually he was a Prosthodontist). He made the form, which is like a plastic retainer, and with a few modifications I was able to start talking. I now could say almost anything. One physical problem still existed with me. My stroke caused something called Dysarthria. All the things which are required for normal speech are extremely weak. Breath support, lip strength, tongue lift, protrusion, facial muscles, all the things that you take for granted when you speak were severely affected. I can talk but it is very soft. I’ll take that though. With the Palatal Lift, I was able to vastly expand my word list. I practiced every day. My breath support was still very weak, though. As hard as I tried, I could only say one word at a time. Every word I spoke my wife would pronounce the word back to me after I said it. This was necessary so I could confirm she understood what I was saying. If she said the wrong word, then I would shake my head no and I would say my word again. If I could not pronounce a word correctly and my wife could not figure out what I was trying to say she would ask me to I spell the word instead of pronouncing it incorrectly over and over. Pronouncing letters was much easier and clearer. I did not mind if it meant that I was being understood. I seemed to still be recovering from my stroke. My wife, me and all of my out-patient therapists felt that another in-patient hospital stay might provide a more intensive therapy environment. My insurance company approved me for another in-patient therapy stay during the summer of 1996. My new SLP suggested that I receive an evaluation by an Ear, Nose and Throat (ENT) doctor. I went to my ENT and he evaluated my vocal cords with a video stroboscope. A video stroboscope was used to make a video of my vocal cord movement. The video gave my ENT the advantage of watching closely how well my vocal cords moved, plus he could show the video to others, too. The video showed that my vocal cords were not actually paralyzed. It showed that my cords tried to close but would stop short of coming together. That accounted for the lack of vocal cord vibration and a whisper like voice. The ENT studied the video further. After reviewing the video with his associate they concluded that I was a candidate for bilateral implants, VOCAL CORD MEDIALIZATION. He explained that this operation is more frequently performed when one vocal cord is paralyzed but he had seen it done on both. He explained what the procedure was in detail. PROCEDURE: First, he would make a horizontal incision from left to right across my neck. Then, he would fold back my neck skin so that he could perform the procedure on my vocal cords. Next, he would slice off small pockets, approximately ¼” long by 1/16” deep, from the cartilage on my cords. Then, he would fit small silicone implants into each pocket where he just cut the cartridge away. This would push the gap between the cords close enough together that they would vibrate when I talked but not too close that they would inhibit breathing. I would be given “twilight” anesthetic so he could ask me to speak during the procedure to make sure the implants were of the optimum thickness. Finally, he would close my neck skin over and stitch me up. He asked me if I wanted to try the operation. I whispered, yes. I had my procedure at the end of 1996. The sound of my voice improved but was still very soft. Poor breath support prevented me from projecting my voice. I am sure that this procedure would work fine for anybody who could control their diaphragm. It helped me get a voice easier but the procedure was limited. I needed to be able to control my diaphragm if I wanted to speak normally again. What was neat was that I COULD TALK with a voice. I mean I could talk with a voice before but I had to push really hard with my legs. I still had to tense up each time I spoke and push initially, “kick starting” my voice, but after that the word came out easily. Several years after my operation, something terrible and unexpected happened! It would change my life forever! It seemed like this happened out of the blue. I was in the fourth year after my stroke. My legs tingled after my stroke. I had just assumed that it was a side-effect of my stroke. How wrong I was! The tingling was slowly becoming extremely painful. My legs felt like I had bad sunburn. I suffered with this pain for several years. The pain was becoming progressively worse. I went to doctor after doctor. Nobody was familiar with the symptoms. One day, my wife was reading a magazine about stroke. The person who wrote the article had symptoms similar as me. They were being treated successfully by a Pain Management Clinic. This type of pain had a name. It was called CENTRAL PAIN. Unfortunately, Central Pain would ruin my life forever! FOOTNOTE: Shortly after my stroke, I found that with the proper setup I could use my COMPUTER. I downloaded an ON-SCREEN KEYBOARD and purchased an INFRARED HEAD POINTER. This setup allowed me to type and move the cursor almost as well as most able-bodied people. I sent literally thousands of emails, hosted an America Online chat room for stroke support, taught myself HTML and created over a dozen websites, plus accomplished many more things. Since 1995, using the computer has been my most extensive form of communication! To learn about my various types of communication on the computer, read my blog article, Disability. . . Not on the Computer. One more thing, when I say that I cannot talk I am sort of lying. The communication techniques I mentioned above caused me to practice forming words and attempting to pronounce them with voice on a daily basis. It also caused my wife and kids to try and figure out what I was saying to them. They had to watch my mouth several times daily, especially my wife, because she is my caregiver and is with me the most. They all practiced READING LIPS as often as I practiced MOUTHING WORDS. Eventually, it became easier for us if I just mouthed the words and not put the effort into saying them with voice. By this time, they were just reading my lips, anyway. After years and years of practicing how to form words with my mouth, I now just mouth words and my wife and kids read my lips. So today, I “talk” to my wife and kids regularly! This is my story of how the computer and being on-line has made a difference to me. Being on-line has helped me keep my sanity at times and is probably the single most reason I keep myself active, brain active, that is. On-line service is more important to disabled people who can access it more than able-bodied people will ever know. I’ve met hundreds of super, disabled people on-line. The Internet allows us to meet, from all over the country, and sometimes the world. Many of us would not be able to make this trip without this cyber travel. E-mail, message boards and Internet chat groups have become a way of life for me now. I turn on my computer each day and have a routine where I check each and communicate back accordingly. Stroke affects many people’s cognitive skills but I was lucky this was not the case for me. I am quadriplegic but I sometimes think that having my cognitive skills intact has made it a worthwhile trade off. I don’t mean to imply that other stroke survivors can’t think for themselves but I don’t have to deal with some of the cognitive problems that others may have. I will try to explain how my life has changed and how I have found a way to continue to feel productive. My stroke occurred on June 20, 1994 while I was in France on a business trip. I spent two weeks in acute care in France and then four more at a hospital in Washington D.C. I was then moved to one in Baltimore for rehabilitation. I spent two months there. My doctors tried to prepare me for the worst condition of recovery. I had quadriplegia, couldn’t speak, and had to receive liquids through a stomach tube. I also had many other symptoms associated with quadriplegia. I couldn’t believe that my once promising career was being replaced with this life style. Four days before I left the rehabilitation hospital, very minor movement started returning. I was was still discharged on time so I continued therapies as an out-patient. I continued to make progress but it was extremely slow. At home, in my leisure time, I was starting to use the computer. I had regained enough movement in my left arm and hand that I would slide the mouse around and click when I wanted. I was rigged up with a Plexiglas lapboard which rests on the arms of my wheelchair. The mouse pad is placed on the lapboard in front of me and my hand is then positioned on the mouse. I could move the cursor to wherever I need to go on the screen. I type using an on-screen keyboard. My on-screen keyboard has “word prediction” so that I only have to type the first letters of the word. My keyboard displays a list of words that begin with those letters. I then click on my word. This software speeds up my typing significantly. I usually type fast enough that I can go on-line and keep up with chat groups without being noticeably slow. My on-line playing games became a way to supplement my therapy life. When I wasn’t at therapy you could almost always find me on the computer, often on-line. Sometime in early 1995, I discovered a small bulletin board on AOL for stroke survivors and stroke caregivers. I made a couple of posts there hoping to just talk to another stroke survivor. Pretty soon I was emailed and invited to join their bi-monthly chat group. Members from the bulletin board would write each other letters of support and meet in an AOL chat room every two weeks. I really wasn’t interested at first. After receiving these emails for several weeks, I decided to look into what this group was about. I found out that many of the members knew little about how to use the computer. My computer skills were relatively good so I offered my technical help. I would answer questions about how to use the computer. Sometimes, I wrote about how to use the Internet. I must have written 30 or 40 plans. I would mass e-mail one per day. They were very well received and appreciated. This motivated me to want to be more involved. Several members of our small on-line stroke support group eventually began discussions that we needed to have our own “web page.” There was a lot of e-mail being circulated about this issue within our small discussion group and it soon became painfully apparent that no one knew how to make a web page. Finally, I said that I would try (I had no idea of what or how I would do it). I did pretty extensive research on AOL. AOL gave each member the resources necessary to create a personal website. Soon, I had learned enough and I made my first web page. It was not anything fantastic but it had some basic information about stroke. I visualized many ways for expanding it into a larger website. Our support group started actively corresponding with each other by e-mail with links to other websites with information about stroke. We soon realized that the links were growing and someone would have to organize them. I felt obligated to do this because I was making the website. I had the basic structure of the website mapped out all in my head. The website started to grow from one to over 50 pages. This of course didn’t happen overnight. I was working on it 10 – 12 hours/day. There was so much to do! I’d like to say that as the “webmaster” for that site it kept me extremely busy. There were updates to do almost daily. Adding a new link that someone found. We were all proud of our web page. It reflected what many of us collaborated on. The only problem was that the website was owned by AOL. The website was created on my personal AOL account. I saw this as a big problem because AOL had lots of technical limitations on the features of their personal websites. This problem could be fixed but it required that the website be created on the Internet and discontinued on AOL. This was fine but it would cost money to own a website on the web! I saw that having a website that stroke survivors and stroke caregivers could go to and meet others who could empathize with their situations was extremely important! The website also had lots of information about stroke. I was so determined to make the website happen that I agreed to finance whatever was needed. It was financially tough on me the first few years. I could not afford to keep funding the website out of my own pocket. I had heard of non-profit organizations but would we qualify? I knew that having this status would make a big difference with being able to solicit donations and have fundraising events. But how would we go about it? After a lot of thinking, I got the bright idea to perform searches on the Internet about this subject. I learned that I would need a lawyer to help me navigate all the legal forms and filings. I performed more searches and actually found a lawyer who specialized in getting non-profit approvals and did everything pro bono. Lots and lots of emails were exchanged between me and the lawyer. I cannot talk so speaking on the phone was not an option. It took months of me sending information. The first step was to become incorporated. The lawyer submitted our paperwork. It only took about a month. In 2000, we were incorporated as The Stroke Network, Inc. The next step was to receive non-profit approval. Again, lots of emails were exchanged. The lawyer submitted the paperwork and about three months later we finally became a 501(c)3 non-profit charity organization. We named our organization The Stroke Network. Our website is located at http://www.strokenetwork.org/. We were the very first on-line stroke support website. The Stroke Network was also one of the first on-line non-profit organizations. We had our first fundraiser that year and it was a huge success. We have had many fundraisers since then, too. Our financial future would be secure! We have had people joining our organization from all over the world. At last count, we had over 12,000 registered members. Our web page has recorded well over 100,000+ hits, or visits, on it’s counter since May, 1996. To date it has been visited by over 100 countries from around the world. I am the President & CEO of The Stroke Network. I am proud to say that we have about 25 volunteers on staff and 15 people on our Board of Directors. I KNOW that this was God’s plan. His fingerprints were all over this! Way too many things had to happen to make this happen for us! The stars definitely aligned! And the best part about it was knowing that He chosen me to lead the way. I hope you can see that there is life after disability. The computer is certainly one way this can be done. Don’t ever give up on yourself. My disability is from stroke. This is just one disability of many. Where there is a will there is a way. Over 20 years ago I would have never believed I’d be doing what I’m doing now but I love it. You couldn’t pry me away from my computer no matter what. I even don’t mind being disabled. That may seem hard to believe but I have my reasons. Spending time on the computer, on-line, has helped make living with my disability more manageable. Well, that’s about it. I feel very productive doing these things. One thing is for sure…I may be disabled…but on the computer I’m practically able bodied again. Footnote: Around 1997, I had to change my method of typing because I was doing so much of it! It was not uncommon to see me on the computer 12 – 14 hours per day, 7 days per week. I found that other, must easier, methods of making the cursor move than sliding my arm around on top of my lapboard were available. I began using an infrared head pointer instead. This was 100 times easier and lightning speeds faster! I just had to move my head and wherever I looked on the computer screen the cursor automatically moved. Gone were the days of my arm getting totally worn out from me constantly pushing it. My shoulder muscles do not work so all of my arm movement was caused by my arm’s bicep and triceps muscles. My determination and willpower kept me typing but it was becoming more and more difficult to type for long periods of time every day. I also wanted to mention, how much my faith in God has played such an important role in me being able to accomplish what I have. Due to health issues, I lost all ability to move my limbs. Basically, the only real movement I retained was my head control, which allowed me to move the cursor and one finger, which allowed me to click the mouse. These two movements are all that is necessary for me to be able to use the computer and type whatever I want. I have been using this method for over 15 years! I am so thankful for what I CAN do! It is not much but is just enough that I can still work at my non-profit organization and on our website. My point is that God definitely had a plan for me. I feel that all my work has been inspired by God! God is awesome! Are you living up to your potential? I know that stroke can be extremely devastating to how you perceive yourself. I thought that if I can change a couple of minds then maybe my story might be worth reading. I have to warn you, what I am going to say has not all been a can of corn! Let me take a few minutes to give you more about my background so it makes sense why I wound up where I am. I didn’t just fall into this, where I am now, but followed the path of least resistance. I had my stroke while on a business trip in Toulouse, France. That was in 1994. I was only 36, which I found to be the age range of most stroke survivors who use the Internet. Ages 30 through 60 are a more predominant age for stroke than I ever thought. I had a reasonable education of an Associates Degree in Engineering Technology and a Bachelors Degree in Business. I thought that with my education and background that I would go a long way with my career in Aerospace! I was highly motivated and willing to work my tail off! I had spent my first five years in an aerospace laboratory performing tests and writing technical papers about my mechanical and physical testing. I think that performing this type of work is what makes me so analytical and motivated to take the time to be able figure things out. This was a great job but was not something I wanted to do forever. I spent the next two years working as a Quality Engineer. This job also required an analytical approach but usually meant that we were the bearer of bad news that our plant had manufactured a part incorrectly. My last seven years were spent as the Group Quality Engineer in charge of the other Quality Engineers and Inspectors. I had too much responsibility and I could hardly keep track of everything. I had to travel all over the world and visit businesses that made parts for my company. I was also expected to stay on top of what was going on in our plant. My company manufactured the cowlings that wrapped around the big Pratt & Whitney (Pratt) aircraft engines. The cowlings were actually referred to as Fan Reversers, as they helped stopped the aircraft upon landing. I was the one who had to give each Fan Reverser a final inspection before they left my facility. We would then deliver them to Pratt at the Airbus facility in Toulouse, France. Pratt had to place them around their engines and then assemble everything onto the wings of the A-330 aircraft. Pratt wanted me there for the first few in case there was a problem. I was stressed to the max! I could not make a move without somebody asking me 80 million questions! I was burning out and snapping at people over nothing! I think the 14-hour days caused me to reach my breaking point! One morning I woke up and the room was spinning out of control. I was having a TIA, also known as a mini-stroke. The TIA’s only lasted for minutes but I had several of them over the next three days. I just thought I had just been working too much. Then, my stroke happened, it hit me like a thief in the night! I tried calling my wife from the French hospital but just gave a garbled a message. I thought I was speaking clearly but found out later that I made no sense. Little by little, over several hours, my motor controls completely stopped. I was locked-in and had no movement below my nose. Now here is the scary part, my cognitive functions continued to function at about 95%. Can you imagine not knowing what was going on, not being able to talk or move and your doctors and nurses talking to you in a foreign language? I can order French meals and knew some of the common French phrases but that’s about it for my knowing the French language! I recognized about 5% of what they were saying and everything else was Greek! They took me to an operating room and put me to sleep. When I woke up I had a tracheotomy! Talk about nightmare! It was every ones worst dream come true! Needless to say, my story is probably not much different, in principle, than most of you. Things could not get much worse and I decided right in the beginning that since I still had my mind that I was not going to give in. Figuring things out was my specialty. What was so discouraging, though, was that I was REALLY paralyzed. I could not fathom how weak I was. I don’t know how you guys feel but my paralysis is a total weakness that is impossible for an able-bodied person to imagine. I had a feeding tube down my nose, a suction tube down my throat and an oxygen tube hooked up to my throat. I did not know how I looked and still did not know that my speech was gone because of the stroke. . Anyway, I want you to understand that I have had my share of shock and awe! I know that you and your loved ones have gone through equally devastating times. I do not consider myself to have gone through anything more or less than you all have. Just consider that the pain that we all have gone through as enough to make us brothers and sisters. Do you remember the movie with Richard Dreyfuss and Bill Murray called, “What about Bob?” Murray plays Bob and Dreyfuss is his psychologist. The good doctor goes on vacation and Bob follows him there bugging him for advice about his psychotic life. He is told to think about taking life in baby steps, meaning, take things slow. Take your time making decisions about only one thing at a time. Overcome it, accomplish it and then move onto the next thing he wants to overcome. This was my mantra almost from almost day one. I knew I must not focus on improving more than one thing. Whatever it was, it had to be achievable and then I had to move to my next goal. Of course, my very first goal was communication! Without it I was toast! This had to be the worst period of my life! Living without communication is a horror story and I lived without it for over a month! I had to make contact with the outside world. My inner dialogue was perfect. I had to let everybody know that my mind was still there and that I could feel everything that was being done to me. I began communicating by blinking once or twice to yes and no questions. Next, I was blinking to the written alphabet to spell out words. And finally, I was staring at objects I was interested in and looking at a communication board to spell words and sentences. This progress did not happen overnight and took tons of patience. I thought, baby steps, Steve, baby steps! Next, my most important goal was being able to move and control my head. The human head probably weighs over 10 pounds. If I were sitting up in bed my head would flop over. The nurses would prop pillows on either side of my head. Eventually, one of the pillows would move down and my head would move with it. One time, I was propped up in bed and left by myself for about an hour. My wife had to go eat dinner and a nurse was supposed to look in on me, which she didn’t. Gravity soon started making the pillow move down and so did my head. My neck and head eventually were almost perpendicular to my body. I know I had to look contorted! The nurse obviously had gotten called away and then forgot about me. My wife came back from dinner and found me like that and was furious! Little by little and day by day my neck was becoming stronger. I had to continuously perform neck exercises. For a long time, my head was bobbly. I started by lifting from left to center and then right to center, forward and backwards, over and over. The computer use was excellent exercise, too! Slowly but surely my head control became better and better. “Baby steps, Steve, baby steps”! I guess my point here with telling you about my first goals and accomplishments after my stroke is to let you know that life after stroke is nothing more than a series of baby steps. You cannot give up because you think your life is ruined. I could see that the only way to get whatever I wanted was to use my noggin and then to figure out a way to make it happen. Setting goals that are too much could make you think that something is not achievable . But, start out slow and bite off a small piece of it, just a nibble. Be patient and take your time mastering that small piece. You can do so much more than you ever thought. If you go to my web site at http://www.stevemallory.org/ you will see that I have been extremely busy over the past 10 years. I was able to accomplish these things by taking it slow, not trying to do too much at once and then making sure that I mastered whatever it was that I had to do. I certainly do not have everything listed. Just the ones that I do have listed should show you that I made up my mind not to sit still after my stroke. You must live up to your potential if you want to feel that your life has been successful. You do not have to feel that having a stroke was the end of your life. It’s true, things will never be the same again but does that mean that living a productive life is finished? Are you ready to end things just because you are out of shape, walk or talk funny? It’s not the end of the world but making a life for yourself again is something you and your family can brag about! You don’t need your old job back or have to drive again, especially if it’s not safe to do so. What is important is that you are the best person you can be and that you aren’t sitting around feeling sorry for yourself. Most people know that I am a Christian and although I am not going to evangelize, please bear with me while I quote my favorite scripture. This verse was the key to me being able to accept what I became after my stroke. I had so many things wrong with me that this burden was almost too much to live with. So, I made up my mind to do what I could and to do them well and to just accept what was too much to change. I feel like I’ve lived up to my potential by doing things this way! A friend once told me that life is like a blank canvas. You can draw anything on it that you want. I was browsing the web today and came upon a stem cell website. I had my stroke over 14 years ago and thought that I understood how a stroke happened pretty clearly but boy did things become clearer today! I read what had to be the very best explanation of stroke I have ever read. There were an adequate supply of “technical” terms to make most health professionals happy, too. Stroke is explained on almost every website that has content about stroke. I have always felt that most of these explanations always lacked a practical explanation that left the reader with a true understanding of what a stroke truly is. We all know that a stroke happens when the flow of oxygen is prevented from going to the brain. Stroke involves much more than that though. I was always confused between the terms, thrombosis and ischemic. To me an ischemic stroke meant that it was a clot; ischemic meaning a clot caused the stroke. This is true and false, both. It is true that ischemic means that a clot caused the stroke but actually the word, thrombosis, is the correct medical term for clot. So, technically, a thrombosis causes an ischemic stroke. You learn something everyday! Hey, what do I know, anyway? I had a brainstem stroke! Go to http://www.xcell-center.com/treatments/diseases-treated/stroke.aspx for this excellent explanation about stroke.